Jess Goulart of BTRtoday recently asked me how I think branding has changed over the years. I told her that although businesses are sharing their brand stories in more inventive ways than ever before, some of the traditional elements of a successful brand remain unchanged. For instance, a company’s name and logo are powerful elements of a brand. 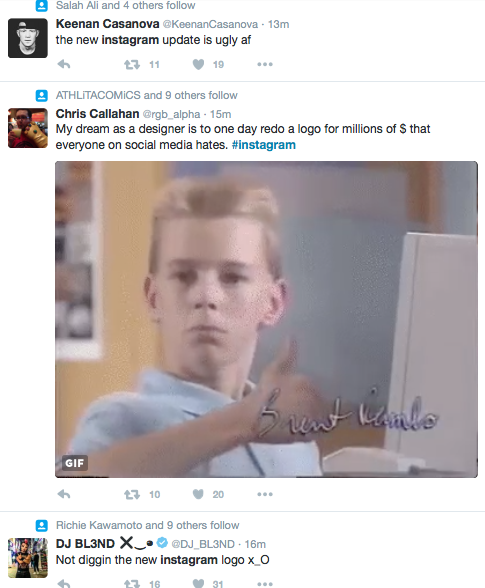 Case in point: the Internet firestorm caused by Instagram’s new logo and Budweiser’s temporary name change. On May 10, Budweiser went to “potentially ingenious, potentially absurd branding extremes” in the words of Fast Company‘s Mark Wilson by announcing that the King of Beers was changing the name on its cans and bottles from Budweiser to . . . America. In a press release, Budweiser noted that the renaming coincides with “what should be the most patriotic summer that this generation has ever seen, with Copa America Centenario being held on U.S. soil for the first time, Team USA competing at the Rio 2016 Olympic and Paralympic Games.” The voice of Bud noted that “that these cans and bottles aim to inspire drinkers to celebrate America and Budweiser’s shared values of freedom and authenticity. Why the name change? Because nothing says America like swigging beer in the summer, right? And Budweiser has a history of appealing to patriotism with its branding. The renaming amps up something Budweiser has been doing already. On the other hand, the rebrand attracted a lot of coverage from A-list news media, such as Fast Company, The New York Times, and The Wall Street Journal — the kind of coverage, as they say, that you cannot buy with advertising. For my part, on Facebook, I couldn’t help but consider the ironies of the rebrand in this most bitterly fought and surreal of election years. Would the special-edition American carry a corrosive taste resulting from bitter political squabbling and screaming into the social media void? 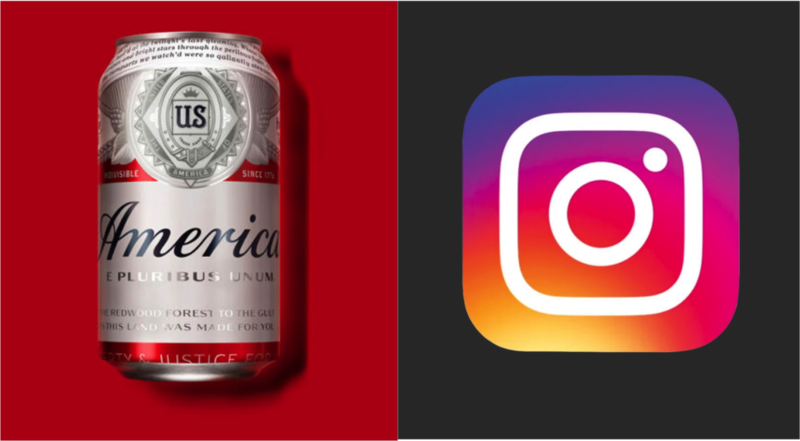 Meanwhile, as social media was going crazy over Budweiser, Instagram was changing its logo. And boy, did Instagram ruffle some feathers. By shedding its well-known image of a retro camera to a more conceptual, colorful image, Instagram annoyed the many members of the digerati who loved the old look. And, the Internet griped, as it did with Budeiser/’Murica. Liam Stack of The New York Times summarized much of the backlash in his article, “The Great Instagram Logo Freakout of 2016,” in which he pointed out some of the sarcastic Internet memes and otherwise widespread cringing that occurred. 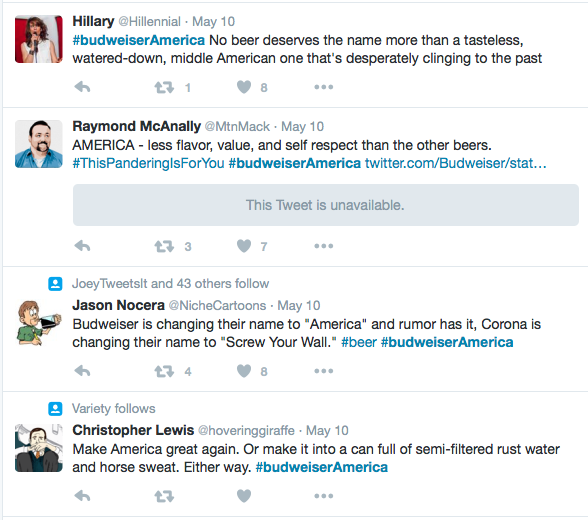 Budweiser might have faced some backlash with a name change. But Instagram got crapped on. On Medium, Ian Spalter, Instagram’s head of design, analyzed the reasons for the logo change, which is a fine read if you want to dig into the rationale, but 99 percent of Instagram’s 400 million users don’t care for the backstory. They’re either going to like what they see or barf, and context be damned. Why? Because names and logos create emotional connections, which is what branding is all about: the power of emotion. You can do all the left-brain analysis you want to measure the power of branding, using yardsticks such as brand lift, and you can analyze your reasons for the choices you make. But numbers and explanation don’t capture the emotional appeal of a brand. People don’t like to have their emotions messed with, and when a business changes its name or its logo, that’s exactly what happens. But just as we get over romantic break-ups, the passage of time eventually heals the emotional break caused by a change in a name or a logo. Remember the uproar when Andersen Consulting changed its name to Accenture? The critics mocked the “accent on the future” meaning. Nobody’s laughing anymore, are they? On a less dramatic scale, Google raised eyebrows in 2015 when the company tinkered with its word mark. But now we are comfortable with the san-serif Google. Yeah, we get over the hurt that comes when a brand crumples up our loyalty into a paper ball and tosses it in our faces. We scream and pout, but we move on. For that reason, I think the Gap made a mistake in 2010 when the company ditched its new logo amid howls of protest. Had the company remained patient, I can assure you no one would care about the old logo today except for fans of nostalgia. At a time when consumers are supposedly more empowered than ever before, ironically the uproar caused by Budweiser and Instagram remind us of an essential truth: being empowered doesn’t mean we want to call the shots completely. We want a relationship with brands. And brands wield power in that relationship. Otherwise, why would we care so much about someone changing their name or logo? This entry was posted in Marketing and tagged Budweiser, David Deal, Instagram, Superhype. Bookmark the permalink.